Gnetophyta - Wikipedia, entziklopedia askea. Gnetum adibidez: Gnetum gnemon (haziak jangarriak). 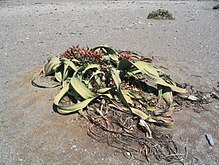 Welwitschia espezie bat: Welwitschia mirabilis. basamortuan bizi da, Namibian eta Angolan. Ephedra (batzuk sandabelarra dira, efedrina). Gifford, Ernest M., Adriance S. Foster. 1989. Morphology and Evolution of Vascular Plants. Third edition. WH Freeman and Company, New York. Orriaren azken aldaketa: 21 otsaila 2019, 06:18.